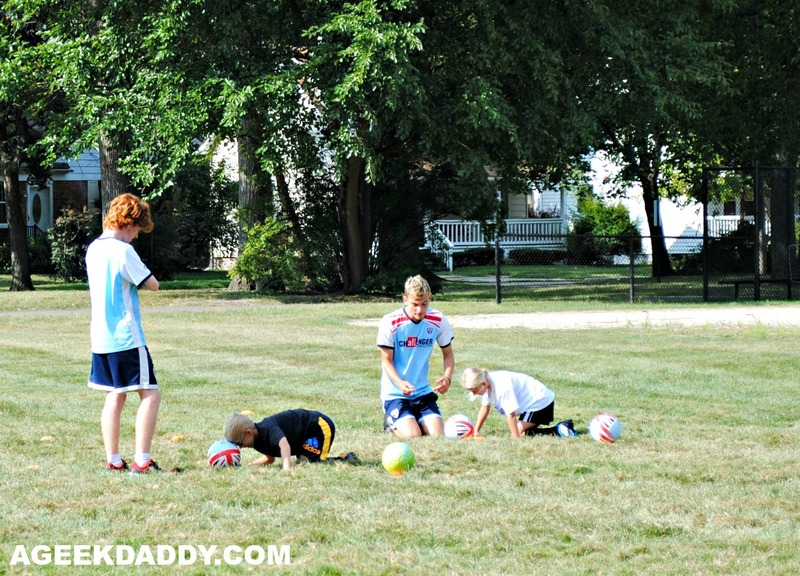 My kids spent the last week of summer participating in Challenger Sports' British Soccer Camp. It was a week long half-day program that took place at a local park. Challenger Sports brings in college aged coaches from the United Kingdom to run these sports clinics that in addition to helping kids develop their soccer skills also serve as a cultural exchange between the camp's staff and its participants. The two coaches we had for our session call London and Liverpool home and interacted really well with the kids in their group who ranged in age from six to twelve years old. My son and daughter both commented to me that these were the most personable coaches they've ever had at a soccer training clinic and they really enjoyed going every day to this camp. Chatting with the coaches they reflected on how in America players are really focused on individual skills and performing stunt moves while in Europe there is more of a focus on understanding the overall flow of the game and teamsmanship. They mentioned how children in Great Britain "live and breathe soccer" growing up and there is a national passion for the game. Our ambassadors from England made a good effort though for the camp's attendees to see the sport through the British perspective. The camp didn't have an intensive focus to improve individualized skills but rather utilized drills and games to promote an understanding of the game and encourage working together as a team. To reinforce not using your hands in soccer, attendees participated in a relay race where they dribbled a ball to a cone with their feet. They then had to maneuver the ball on top of the cone using just their forehead. 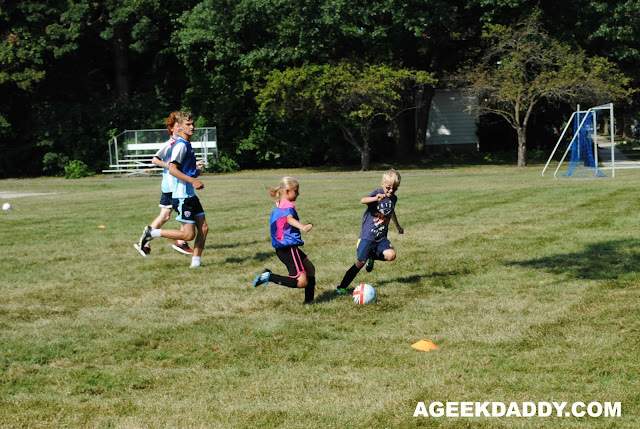 During the week, the kids engaged in a lot of different Soccer ABC activities that are designed to help them with their agility, balance and coordination. Incorporated into the week were also a variety of games meant to encourage the kids to strategize their actions instead of just letting game situations dictate their behavior to them. Promoting teamwork was also a major theme of the camp's activities. 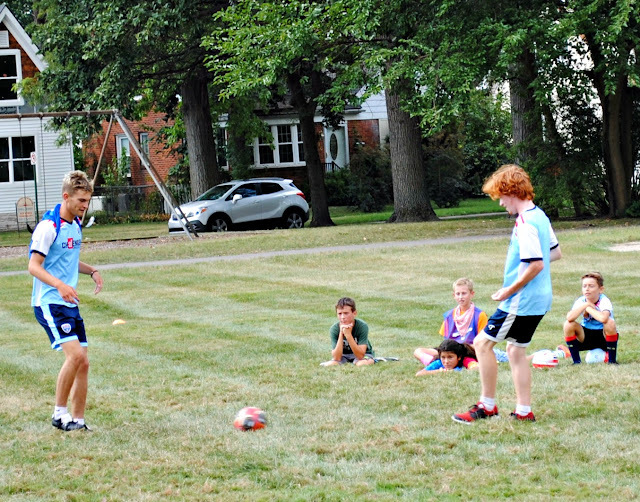 Kids were frequently required to pass or play defensively as elements of the camp's drills and games to encourage a team mentality and promote them having a well-rounded skill set. A nice aspect of my kids' British Soccer Camp experience is that they received a lot of personal interaction with the coaches. They spent a lot of time with my son helping him improve the accuracy of his passes and showing him how to quickly control the ball when he's on the receiving end of a pass. With my daughter the coaches really assisted her in understanding how the placement of her feet impact shooting the ball and that led to a noticeable improvement in the accuracy and power of her shots. My kids have been really energized to start their fall soccer league since attending this camp. 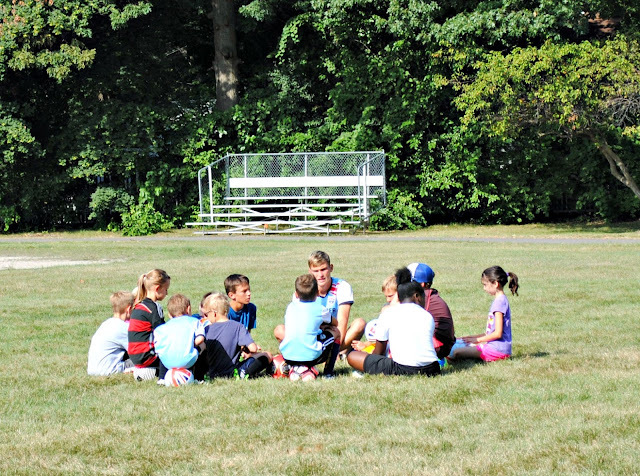 In addition to the workouts, the coaches also would huddle up the kids throughout the camp session and talk with them about aspects of the game, how certain activities were supposed to help their overall game play, and described some of their own personal soccer experiences. This seemed a nice way to get the kids attention instead of trying to communicate everything in the midst of drills, games and scrimmages. Plus these chats provided a nice break for the kids to be off their feet for awhile and get a rest. All in all my kids really had FUN during the British Soccer Camp and left it with a better appreciation of the game. We had some great lads coaching their camp and it seemed like all the kids who attended it enjoyed their experience. At the end of the camp, the coaches shared with each of the attendees what they personally excelled at and also the things that need to continue practicing on. Plus each kid also received a handwritten report card from a coach to take home with them containing some tips to help them continue improving playing the game and a nice note about the week they had just spent together. 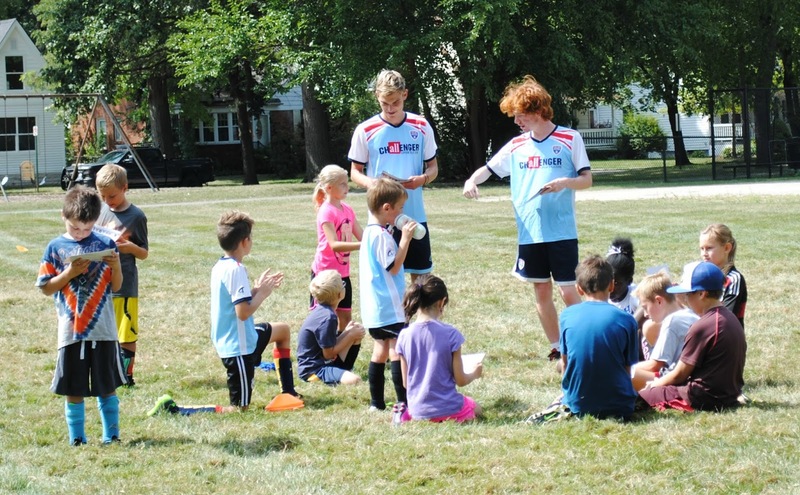 Each British Soccer Camp program includes a soccer ball, camp t-shirt, action poster and camp report card within your registration fee. When comparing the cost of this camp to other similar programs, you are essentially getting these items for FREE! Plus if you register for a camp 45 days or more before it begins, they'll also provide a really nice Challenger Sports soccer jersey for just the cost of shipping and handling. My kids love these jerseys and wear them all the day since camp wrapped up! For more information about Challenger Sports' British Soccer Camps or to find an upcoming one near you, please visit www.challengersports.com/british-soccer.